Carlisle sells quality grilling tools. Professionals agree, the right tool can extend the life of your grill and enhance the flavor of your steak, burger, beef, chicken and pork. Cleaning your grill isn't a big deal when you do it with the Carlisle Broiler Master Grill Brush. Try these tips and tell us how it goes. First, light it up. Generate some intense heat for about five minutes. Burn away what was left on the grate from last time. (That’s right, you did the right thing leaving your grate dirty). Now grab your Carlisle Broiler Master Grill Brush. 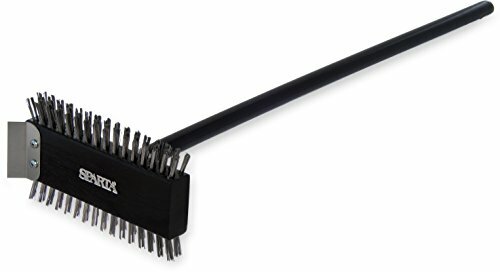 The long lasting durable stainless steel bristles, the metal scraper, the right handle with steel threads and a little elbow grease turn this small investment into years of additional life to your grill. After cleaning the grate, dip a wadded paper towel in a little oil and wipe evenly over the grate with a set of tongs. Be careful - use too much and you'll have a flare up. This part is up to you. Be sure to brag in the review section below! That’s right! Leave that blackness on. While it’s warm get rid of food or bits but leave the black on the grate. This will protect your grill from rusting. You still need to clean out the ash if you are using charcoal. Keep a metal bucket nearby where you can discard the ash and allow it to cool before you throw it away. Keep the outside clean but let the inside be dirty. Just like a good cast iron pan - grilling over and over will effectively season your grill. This makes food taste better and helps hold a constant temperature. Good luck. Tell us about it. Enjoy!